Small/Medium - $29.99 Medium/Large - $29.99 X-Large - $29.99 Only 6 left! Are you on the up and up when it comes to your horoscope? Do you know what's up when it comes to what planets are in each of your houses? Maybe you always know what's in retrograde and what exactly retrograde actually means. Or maybe you just browse your monthly horoscope when you're bored at work. Now, what exactly is the difference between a run-of-the-mill cauldron witch and a celestial witch? A cauldron witch might have some serious skills when it comes to whipping up spells and potions but celestial witches are amazing at changing actual fates. They can tell you when a good time is to make a risky business move. Or they'll let you know if that fella you met last night is to be your soul mate or just some cad. So go ahead and connect with the stars this Halloween and transform into the celestial witch! This costume takes the classic witch look to a whole new level! The red and black velvet dress has a red panel on the front and a sweetheart neckline. The halter style creates an inverted pentagram and attaches to a black collar. The starry tulle skirt flares from a belt at the waist. You'll feel like you have the power to read the stars when you're dressed up in this ethereal costume. 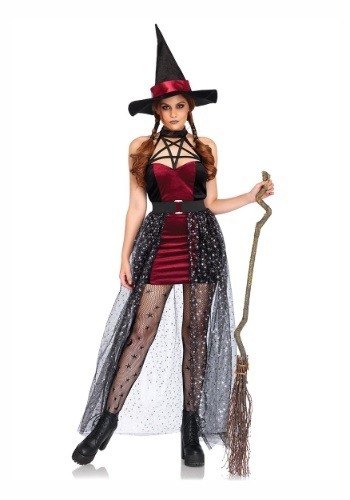 Now, you might not be riding your broom to the Halloween party this year but the layers of this costume will make people think you could have. Just bring one of our prop brooms along to make the look complete. The basic witch costume isn't for someone that's as in tune with the fates as you are. So put on your pointy hat and brush up on your star sign, this is sure to be a luminous night!